The Marion County Sheriff is hoping to hire 90 people in 90 days. INDIANAPOLIS — The Marion County sheriff is hoping to hire 90 people in 90 days. It's an ambitious effort to recruit 47 detention deputies for the Marion County jail and 43 dispatchers at the county's 911 center. "We have been trying to get out the word everywhere that we are hiring." Marion County Sheriff Kerry Forestal said. Starting salary for detention deputies and 911 dispatchers is around $34,000 per year, along with benefits, health coverage, and a pension. Detention Deputy Kenyonn Sincere has been working at the jail for 16 months. He's one of roughly 425 deputies dealing with hundreds of inmates. His responsibilities include processing inmates as they arrive to the jail or are discharged. Sincere also works with other detention deputies to monitor meal times and ensure they go smoothly. Deputies also prepare inmates for court proceedings and transport them to and from court. Sincere says the job requires a positive attitude and says the comradery with his fellow deputies fits what he was looking for in a job. "I can compare it to being in the Marine Corps," Sincere said. "Because it's that type of family environment, to where we have to look out for one another and our success depends on each other." At the Marion County Sheriff's Office 911 center, about 10 new hires are already undergoing six weeks of paid classroom training, before another four weeks of hands-on training. Still, the department needs dozens more dispatchers. If you want to apply for a dispatcher position, make sure you have a calm demeanor, excellent listening skills, and can focus on customer service. Chiquita Watkins started as a dispatcher nine years ago. She has climb the ranks to become a shift supervisor -- proof there is room for upward mobility. Watkins says working as a dispatcher can be both stressful and rewarding. "Knowing that when I answer that phone, I'm possibly helping a child or an adult or elderly, or someone get the help that they need made me stay on longer," Watkins said. The sheriff admits there is work to do, when it comes to retaining 911 dispatchers. 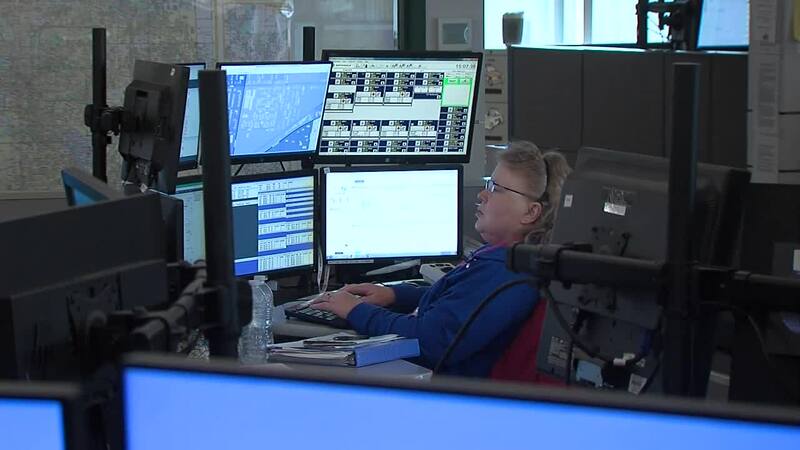 He says it's time to get to the root of that issue, pointing out in the past week, a private industry in another county hired two dispatchers away from the MSCO 911 center, offering between $8,000 to $10,000 more in salary. "It just makes it a challenge," Sheriff Forestal said. "So, we're a training ground for a lot of other surrounding counties and other agencies. We need to continue to look at that, because the investment we have to bring at the skilled worker and then they leave, we start all over again. Do we not want to pay them to stay here?" The sheriff said he's trying to work with the Indianapolis mayor and the City-County Council to secure even more money to offer more competitive salaries to retain workers. In the meantime, Forestal has added new incentives to attract more applicants. For example, detention deputies automatically land on the fast track to become sergeants.